Citrus Squeeze for the Win! A couple of weeks ago I was one of the lucky bloggers who got to attend the San Diego Bloggers kickoff event at Sammy’s Woodfired Pizza in Del Mar. The evening, put together by Rob (@DowntownRob) and the other organizers of the SD Bloggers Meetup Group, was a blast. I don’t claim to know much about Uber (@Uber_SD), but the food and drink provided by the other sponsors, Sammy’s (@SammysWPizza), Bare Mixers (@BareMixers), and Svedka Vodka (@Svedka) truly helped to make the evening. Dining Out Magazine (@DiningOutSD) covered the event and took photos (not the photographer’s fault but I saw my photo…talk about strengthening your resolutions). There are many business lessons in this experience but I’ll stick with my review of Bare Mixers for this post. I can’t think of a better way to revive my dormant blog than to throw in a shot of tequila and go for it. Seems I forgot to get a photo of my prize. I stole this one from http://baremixers.com/. I didn’t think they’d mind. Bare Mixers is the inspiration for this blog post. Natalie and Max, representatives of Bare Mixers were actually at the event serving mini “Blogtinis”, a cocktail made with Bare Citrus Squeeze Margarita Mix and Svedka Vodka. I enjoyed the sample but I needed a bigger drink to be sure (that’s my story). Natalie and Max graciously offered to give me a bottle of Citrus Squeeze to take home and try in exchange for a blog post about my experience. It sounded like a good deal to me, so here I am. Of course, I had to wait for the weekend so I could give it a fair shot. I also invited my brother over so we’d have a bigger trial group…and so that he could bring booze. It was totally fair; I provided dinner. At any rate, Natalie and Max had mentioned a lovely array of alcohols that went well with Bare Mixers. I decided on a Mexican-themed dinner and had my brother bring tequila. Even without ice, because my son must need this recipe, the margaritas were a hit! I just followed the recipe on the Bare Mixer label and ended up with drinks the alcohol consumers among us were quite taken with. That is to say, we really enjoyed our drinks (note to self: lay off the romance novels). My chief complaint, my only complaint, about Bare Mixers is that I need more already. Our little group nearly polished off my bottle with tequila that night and there were so many varieties of alcohol (perhaps better grammatically, but I prefer “alcohols”) that I have yet to try with Bare Mixer. I suppose that just means I’ll have to acquire another bottle. I had a brilliant idea (I thought) for the last of my bottle of Citrus Squeeze – it’s a mixer, not an alcoholic beverage. It’s made with real lemon and lime juices, sweetened with agave, and is only 50 calories per three ounce serving. Wouldn’t Citrus Squeeze mixed with sparkling water be a lovely alternative to soda? Well, it took nearly a week to get from, “Sure, Mom, I’ll try it sometime”, to actually getting a glass in my son’s hand, but I think my trial was a success. He gave me a noncommittal, “Not bad”, before proceeding to empty the glass. Maybe a trial with someone who hasn’t yet achieved teen attitudes would produce different results. 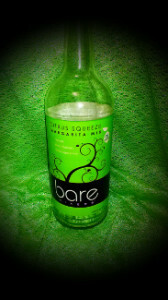 At any rate I can tell you from personal experience that Bare Mixer is good with vodka, tequila, and sparkling water. 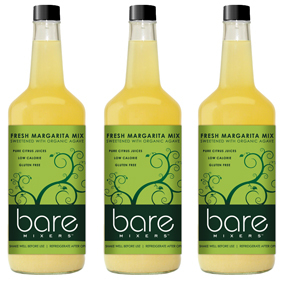 To sum it up and make a long story longer: Bare Mixer – if you haven’t tried it, you should. The last view of my bottle of Bare Mixers Citrus Squeeze Margarita Mix before it heads to recycling. To fully clarify my earlier disclosure: Representatives of Bare Mixers gave me the bottle I sampled. They asked me to write a blog post. They did not tell me what to say or even that I had to like the product they gave me. The opinions described are my own (and my family’s). I was given Bare Mixers Citrus Squeeze Margarita Mix.